Pura Ulu Watu perched on the magificent height on the south side of Bali where the island ends in sheer cliffs which drop graciously into the clear blue sea. Its hangs literally over the sea. The view is truly breathtaking. From the edge of the cliff you can see a wide range of blue ocean and the forest on the rock hill. The sunsets is really superb. Enjoy the scenery while the wind blows into your face and get ready with your camera to capture the most beautiful sunset. Pura Ulu watu is just a simple and little temple with 3 tiered, but the surroundings around this temple makes this temple so popular. This temple is really owns his name. Pura Luhur means High temple. The maingate is unsual, flanked by statues of Ganesh. This is also one of several important temples that dedicated to the spirits of the sea. Other temples are Pura Ulun Danu on the Lake Bratan and Tanah Lot, the most famous sea temple of Indonesia. The visitors are not allowed to enter the temple. It's only for Balinese people who do the prayer. There are a lot of monkeys around the temple. be careful if you're there. They wil grab anything you wear like gold or silver. Take anything off that will attract the attention of the monkeys, your bag, cameras, also your sunglasses, they can be very nasty. 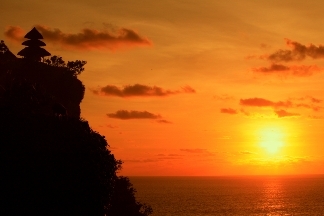 Beside the magnificent height and beautiful sunset, you can also enjoy the performance of Kecak Dance, that holds on the top of the hill where you can enjoy the beautiful sunset while you're watching the performance. 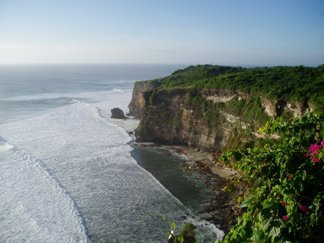 Ulu watu area on the north side is also famous for a surfing place. They have the excellent waves. No wonder that this place so popular is, if you see such a beautiful beach, Suluban beach, two km down through a narrow footpath. 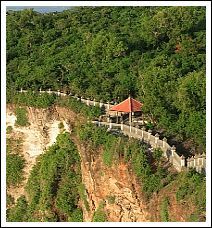 To get there, it takes about half hour by car from Kuta or Ngurah Rai Airport.